Excellent restaurant and lovely chatty staff who were keen give suggestions. We went to celebrate my brother's graduation and he had a great night, I'd recommend this place if you want authentic Indian food ???? Food is all ways good. We have been going for a few years now.all ways good. I had high expectations for this restaurant, as it has had good reviews. However, from my own experience last night, I can say that this is the first and very last time! One of the dishes ordered was the chicken tikka massala. While it was told that it was a mild, sweet curry, it came as a boat load of sickly sweet cream with a few chunks of chicken thrown in for good measure. I am not exaggerating when I say that it was like eating syrupy, creamy chicken. The waiter rudely told me that it was forewarned that it was sweet and creamy and he went on to say that this is not how it would be made authentically in India, but was adapted for "western" taste. As if he was chiding me to say, I should have known better. For future reference, please stay authentic to Indian recipes, then you wouldn't have the mess that we were served last night! Hello there. At first i would like to say that i wasn't rude at all if i was then i would had never told you that,why we make our tikka masala different then others keeping in mind of our customers!! ( people those are rude they don't smile and try to please)as we had a discussion about it for around 5 to 7 minutes ands u ended up saying that its a shame that we don't serve the authentic version of it..i am pretty sure if u have been to india and have eaten in many places then the curry doesn't taste exactly the same as u eat in a former place. we don't take your reaction as rude because we take it as your point of view:). As far i remember the tikka masala we served was for your friend and that was almost eaten and you had prawn saag , but anyway i thank you for your concern. A simple "I'm sorry" goes a long way in the food industry. Your need to continue this "discussion" says a lot. English: The two of us had a good meal. Veggie samosa, curry and mixed grill. It tasted well, though the quantity could have been a bit larger. The place is not extraordinary, just enough to enjoy a good meal. The service was excellent, because we succeeded in having fun with the restaurant people. Nederlands: Met twee personen lekker gegeten. Het eten was goed, hoewel de porties iets groter konden. 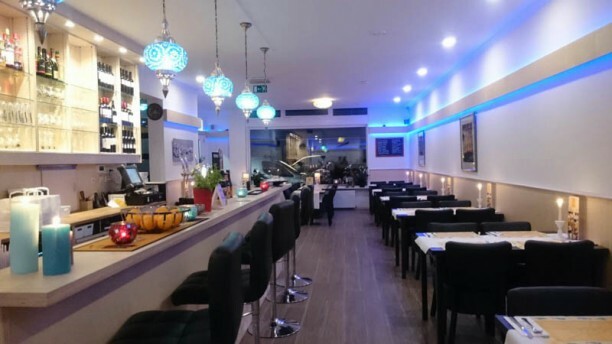 Het is een restaurant zonder al te veel poespas. Het lukte ons om een leuke ambiance te creëeren tussen het restaurantpersoneel en ons waardoor de service super was. Voor herhaling vatbaar.